Sam and Max are back! Let the festivities begin! Singing: "Deck the halls with ...," but wait, there's a problem! Santa has been sending out presents a bit early (it is only November after all), and they're not exactly what you might desire in your stocking hanging from the mantle this Christmas. Following on from the remarkable success of last years' episodic Sam & Max Season One, Telltale Games have returned a mere six months later with a new episode called Ice Station Santa. Oops! Okay, so it wasn't last year -- the last part of Season One, Bright Side of the Moon was released in April 2007. However it is clear that Telltale have found a technology and delivery mechanism that works very well with the game-buying public, and this has meant that it was a reasonably short process (in terms of game development time schedules, that is) to get from the end of Season One to the start of Season Two. 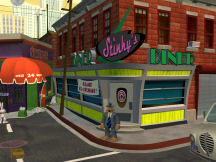 We begin in Sam and Max's run-down office in a not-so-nice part of town. Sam and Max are in the middle of accusing Mr. Spatula (the goldfish) of plotting a coup d'état when the goldfish, bowl, water, castle and all, are zapped by the laser of the Maimtron 9000. Your first task is to stop said giant robot from completely destroying what's left of the neighbourhood. Not that there's all that much left! Fortunately -- or possibly, unfortunately, depending upon your point of view -- Bosco's Inconvenience Store has survived, and, against all odds (let alone logic), Stinky's Diner is finally open for business. 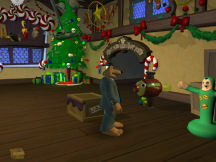 Beyond the neighbourhood, Sam and Max travel to the North Pole to visit with Santa, of course, and his elves. And what Christmas tale would be complete without journeying to Christmases Past, Present and Future? It's nice to note that Telltale have put a remarkable amount of game play and story into just ten locations. There is plenty of interactivity, and both Sam and Max have much to say about, well, just about everything! Whether it's directly connected with the game or not. Given the pattern established by Season One, I expect we'll see these locations will form the core, but certainly not the complete extent, of the locations for the whole season. Episode 201 is not entirely point-n-click: there are two arcade mini-game sequences to challenge your mouse (or keyboard) skills, and there's a third sequence late in the game that's integral to the main plot. However, these are not difficult. The time limit on the first is quite generous, the reaction speed required on the second would get you nowhere in a First-Person Shooter, and the third just requires you to time your shots correctly -- again, the timing is generous. If you're feeling a bit out of your depth when you start the game, there's even a Tutorial, based upon an early part of the Culture Shock episode from Season One. It starts with a simple beginning sequence in which you search the office for Max's newly purchased pile of cheese. Regarding the rest of the user interface, the new episode is nicely consistent with the last Season. 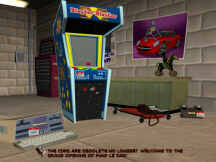 The menu is pull-down (or by pressing Escape) from the top of the screen, with Save/Load, Options, New Game and Quit, and your inventory is found in a cardboard box in the bottom left of the screen. Clicking upon an inventory item makes it the cursor object -- with this you can click on things in the world. There is no combining of inventory items. Right-clicking on inventory items will get Sam to comment on the item. Clicking on a location will make Sam walk to it; double-clicking, when outdoors, will make him run. The Options menu controls Graphics (full screen or windowed, low or high quality images, and screen resolution), Sound (music, voices and effects volumes controlled independently), and text (subtitles, pop-up on-screen labels on objects, and game hint frequency). The game hint frequency has five values, from 'no hints' through to 'frequent hints.' I found that I couldn't really tell it was doing anything when set to 'very rare hints' (level 2), and even set to 'frequent hints' the hints weren't exactly as obvious as a big red boxing glove in the face. The puzzles are a mixture of inventory, arcade mini-game, and dialog. Several puzzles and items are timed. You can't expect a snowball to last forever if you put it in a cardboard box, now can you? There are no mazes (well, not for Sam and Max anyway), colour- or sound-discrimination puzzles, and no sliding tile puzzles. One of the best features of the Sam & Max games is the cartoon graphics. There's nonsense, wit and detail in equal measure. The characters are highly idiosyncratic, but well animated, though few of them move around as much as our (anti-) heroes. The environments are detailed, with plenty of things for Sam and Max to look at, paw, and generally comment upon. Just as with Season One, this game is accompanied by a wild and excellent sound track in a Big Band style, again composed by Jared Emerson-Johnson. The music is consistently upbeat and fun, without ever being distracting or jarring. To go along with this, the voice acting is topnotch throughout. There's not a single wooden puppet among them, if you discount the Four Horsemen of the Apocalypse, and they don't have speaking parts anyway. This is not so much a feature as a small warning. The download for the review version of Ice Station Santa is 106MB, and the final version won't be any smaller. That's at least 45 minutes downloading time with a dialup connection in ideal conditions, doing nothing else for the duration. If you can't guarantee good dialup conditions for an extended period, then you'll just have to wait for the retail DVD version at the end of the season, which is expected to last until April 2008. If, on the other hand, you can manage 100MB downloads, then this one is well worth the wait. New characters, new locations, new arcade sequences, new abilities (Sam can now run), an automatic hint system, and more juicy freelance policery action. What more could you want from a second sequel (if you count the complete Season One as the sequel to Sam & Max Hit the Road)? I am a fan of these games, if you hadn't already picked that up. Bright, colourful, witty, anarchic and plain, simple, fun -- they are a perfect antidote to the gloom that descends at this time of year. Ice Station Santa is the first of five episodes planned for Season Two, rather than the six of Season One. Finally, if you've ever wondered what a Shambling Corporate Presence looked like ... wait no longer: buy this episode. 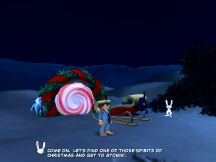 Sam & Max 201: Ice Station Santa is available via download at Telltale Games and on GameTap.